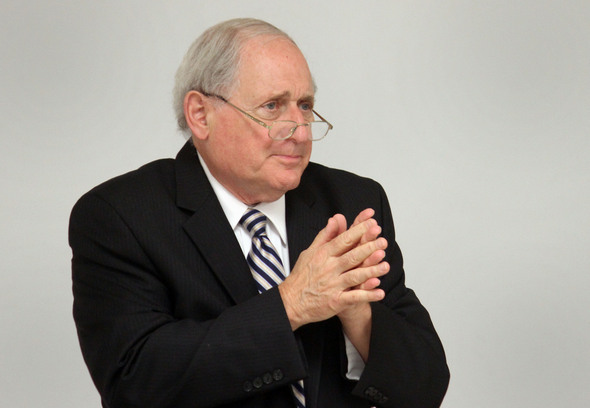 Posted on Mon, Feb 20, 2012 : 3:41 p.m.
Sen. Carl Levin will introduce a Jewish studies minor during a speech at Eastern Michigan University's Student Center Ballroom at 3:30 p.m Thursday. Program Director Martin Shichtman said EMU intends to "be a voice for Jewish culture in southeast Michigan." The program began with online courses in fall 2011. Levin, a Detroit native with a Jewish background, has served in the U.S. Senate since 1978, and is chair of the Senate Armed Services Committee and the Senate Permanent Subcommittee on Investigations. Eastern Michigan's Student Center is located at 900 Oakwood, in Ypsilanti. The program is free and open to the public. Kellie Woodhouse covers higher education for AnnArbor.com. Reach her at kelliewoodhouse@annarbor.com or 734-623-4602 and follow her on twitter. Tue, Feb 21, 2012 : 5:14 p.m.
How ironic! Levin just co-sponsored the National Defense Authorization Act with John McCain that gives the US military the power to arrest and imprison US citizens in concentration camps without a trial or being accused of a crime. The Japanese-Americans opposed this bill. So do vast majority of Americans that are aware of it. Sun, Feb 26, 2012 : 10:01 p.m.
as ron paul supporter ( y'know , the one who lamented the snuffing of bin laden as 'extrajudicial assassination&quot;...which the vast majority of the world approved and rightly so) you are hardly in a position to preach about what 'vast majorities' want, since your own little group live in a looptape world . Part of the paulites special sparkle is your conviction that your tiny trickle ( in republican circles) is a tidal wave ..
Tue, Feb 21, 2012 : 3:17 p.m.
Usual Suspect: I am sorry. On second thought your comment is meant to be a demeaning. I was looking for substance that just isn't there. Tue, Feb 21, 2012 : 12:08 a.m.
Well, it's a step up from Kwame Kilpatrick. A little step. Wed, Feb 22, 2012 : 11:19 a.m. Speaking at EMU. Keep up with the news. Tue, Feb 21, 2012 : 2:58 a.m.
Oh, Kwame Kilpatrick sponsors a Jewish studies program at EMU? News to me! Mon, Feb 20, 2012 : 10:13 p.m. I wonder if he is going to explain the present US policy towards the only Democracy in the Middle East? Tue, Feb 21, 2012 : 12:24 p.m. There are few on these threads, or elsewhere locally, who are more critical of Israel's enemies than i am.. .but your 'dig' at Obama is badly misplaced , as are the similar sentiments of many of my fellow &quot;zionists' ( which to me simply means anyone who believes israel has a right to exist as a predominantly jewish state). Obama has done nothing to suggest he doesnt support the same thing ( and woudln't support it in the event of an even hotter conflict)... He just has the pragmatism...and good sense.. to urge the compromises all parties must make to achieve a realistic peace in the region, even though few seem to be doing anything about it at the moment ( although israel certainly has in the past). Tue, Feb 21, 2012 : 2:41 a.m.
What is it that you wish him to clarify?